This is a similar view to Picture 45, taken around the same time, but looking from the Custom House toward the uptown side of Canal Street. Most notably, we can see a horsecar on the turntable on the outer side of the Clay statue, and we can see the double line of trees still gracing Canal Street out from Carondelet/Bourbon. The dome of the original Maison Blanche building is prominent on the downtown side of Canal, at the right. Horsecars can be seen all along Canal as far out as the trees, which obscure any cars on the tracks farther out. 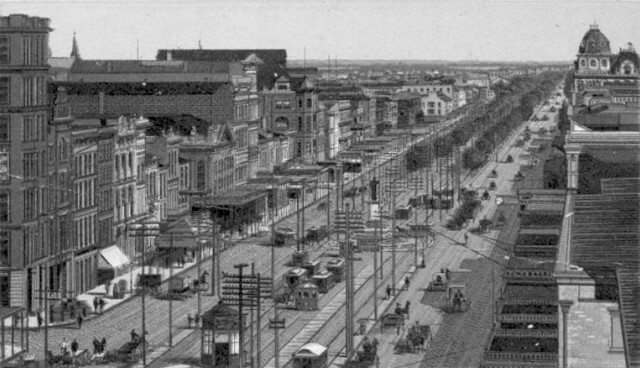 Horse drawn vehicles of various kinds occupy the roadways on both sides of the neutral ground, going in both directions, passing one another on the right and on the left; there obviously were few if any rules for traffic. The original of this picture is a trade card advertising Jersey Coffee. — Ward Bros.